Installing PEX pipe is quite easy. The key is the use of PEX pipe clips. The clips allow the ordering positioning of the pipes, and keeping then out of the reach of nails. It in this picture I have secured the PEX on the main beam supporting the floor above. There needs to be a bulkhead built to surround the beam so it is the perfect location to attach an run pipes. I was fortunate in that there was a wall to one side of the beam just about 2 feet away. This provided the perfect zone to run and protect all the sensitive parts of the water system including the drain pipes. 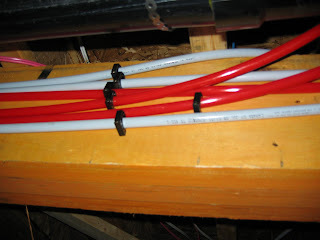 A key location for securing with clips is where a PEX pipe makes a change in direction - like when the pipe is making a 90-degree turn and going from a slot between two joists to a bulkhead area as in the picture. There is a bit of stress and this location so securing before and after the 'turn' ensures that the PEX will stay where you want it to. In this picture you see the grouping of the PEX pipe runs for the bathroom applications including the shower, the bath tub and the vanity sink - 3 hot and 3 cold water runs. There is not particular order, I just placed them as I install them.